Two companies having over 10 years of experience in liquor industr y wanted to develop a multi-store ecommerce site supplying high quality drinks at the doorstep. 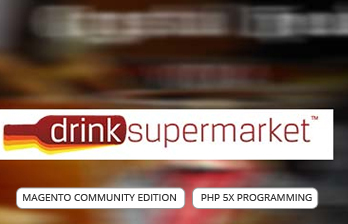 One of the company specializes in supplying hard to find drinks at the cheapest prices with products to home customer (B2C) being shipped to domestic address, where other sell a selection of specific drinks brands delivered to Retail customers (B2B) and focus on selling specific products for which they have UK distribution rights. Two companies require an eCommerce site in order to extend their current selling channels to encompass and facilitate online sales. Since the existing business model of both the companies together involves two sales channels (B2B and B2C), they require a multistore implementation allowing sales via each of the respective channels. Each site will be required to run via unique domains to allow the channel segregation to be evident. International currencies (UK Sterling, US Dollar and Euro) and the ability to calculate the local Duty rates based on the geographical location of the customer. Both sites must also facilitate multilingual support. The client has identified Magento as their solution. SilverTouch, as the development company, will develop the website based on their requirements which are in lieu with the Open Source codebase with certain customizations as required. Below are some modules which were developed in Magento 1.4 in Community Edition. All features and functionalities of Magento version 1.4 were kept intact and customized as required. 1.1. For B2C / consumer site, anyone may view products, prices and description and make a purchase through the website through the use of debit or credit card payment. 1.2. For B2B / business site, only REGISTERED companies with user accounts will have the ability to view products, prices and descriptions once logged into the site. 1.3. For B2B users who have not registered, or logged of the site, only the product name and descriptions should be shown. Filtering of products in categories, Search Results and Tags was done. Adding filters by Custom product attribute was a custom build. Producer Management was desired feature wherein the User will be able to go directly to the producer page. Sage Line 500 was integrated to the Magento back end so as the stocks from Sage Line 500 inventor y from all locations and warehouse can be pulled in the Magento shop. The admin also has the facility to manually override the stock inventor yas received from Sage Line 500 inventory. 6.2. Inter nationalization Facility was also provided where a database of all country Postcode was maintained. 6.4. B2C user while making a purchase can post special message at time of check out. 7.1. Users (B2B and B2C) must have the ability to pay via one of the payment providers enabled for use by the Admin. Admin must have the ability to create HTML based newsletters. Recipients must be grouped to allow specific newsletters to target any given sales group. Users have the ability to social bookmark any Product or Categor y with a simple quick easy click. Individual activity was captured for each department to give proper management of information. The multi store website for B2B and B2C were successfully developed as per the requirements by the clients. The website was developed which will have the activities like payment to the shipping to the domestic addresses. Develop a multi-Store site for B2B and B2C transactions as per requirements of client. Develop a site which will have Purchases which can be made with products being shipped to domestic addresses. Individual activity of each department is captured. The Project was divided into various phases to achieve the best results in less time with optimal utilization of available features, capabilities and new enhancements. Phase i : System requirement Study document and re-estimation. The Application is deployed and is live. It is currently in use.